While on foreign roads, it’s important that you do not commit any driving offences, both for your own safety and the safety of others. The basic rules of the highway are the same wherever you are. 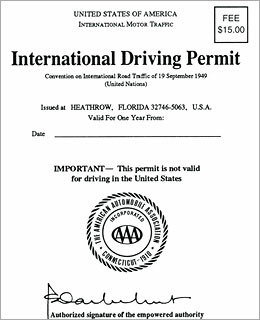 Start by acquiring an International Drivers Permit (for U.S. residents, see below), which is your driver’s license abroad. Also, keep extra copies of your current passport photographs ready. Carry both your International Drivers Permit and your State Driver’s License with you at all times. If you rent a car, always check the brakes, seatbelts, tires, emergency procedures and purchase the liability insurance too. Check for signs of previous damage and draw this to the attention of the rental company prior to driving off. Get enough contact information of the rental company n case of emergency. Driving rules differ in countries, therefore it’s a good idea to get a copy of the local regulations before you motor down the countryside. Check the laws before you drive in any country. Make sure you have emergency numbers – hotel, friend, police, ambulance, etc. Remember most countries especially European nations have extremely strict drink driving laws, so no drinking and driving. Same in the case of speeding and other traffic offences which are subject to on-the-spot fines. Seat Belts. No matter where you are driving, it is imperative that you wear your seat belt. In almost all countries this is a strict law, but aside from that remember that seatbelts are there to save your life, it makes sense to use them. Always know the route you will be traveling. It’s a good idea to carry a road map and chart your course before leaving. Microsoft’s AutoRoute is an excellent GPS based software while driving in (most of) Europe. Keep a first aid kit in the car and bring along plenty of water and munchies. It may be cheaper to buy these at local stores prior to the trip rather than at highway stops. It might also save you some extra stops. If you think you’re lost, take the first exit (if on a freeway), stop by the nearest petrol pump (gas station) and ask for directions. Be polite and make sure you pronounce your destination correct and ask if the person speaks English (if you don’t speak local language – having a language translate guide helps). Also make sure to remember the streets you took to reach the gas station – you wanna go back back on your route, don’t you?! Avoid giving lifts to hitchhikers and strangers. Valid in over 150 countries, the International Driving Permit contains your name, photo and driver information translated into ten languages. Before you travel the world, travel to any AAA office for your International Driving Permit. Bring your valid U.S. driver’s license, $15 (Funds must be in U.S. dollars. Acceptable forms of payment are U.S. bank check or money order payable to AAA and these major credit cards with expiration date- Visa, MasterCard, American Express, Discover Card), and two ORIGINAL passport-type photos – also available at AAA offices (Digital photographs are acceptable, however, they must be of a certain quality. Please read here for guidelines). You may also wish to fill out our International Driving Permit application in advance. NOTE: International Driving Permits may not be issued more than six (6) months in advance of desired effective date. Simply print out the application, fill in the information requested and bring it with you to the AAA office nearest you. If you prefer to secure your International Driving Permit through the mail, enclose your completed application form, two ORIGINAL passport-type photos each signed on the back, a $15 permit fee and a photocopy of both sides of your driver’s license and mail them to the AAA office nearest you. Include additional U.S. funds for expedited return mail service, if desired. The IDP is valid for 1 year from the date of issue.